An early goal by Miguel Angel Alba handed Valletta a narrow win over Mosta at the Centenary Stadium on Wednesday while giving them sole leadership in the BOV Premier League as they move two points ahead of Valletta. The Citizens therefore register a seventh win in eight matches and now look forward for the remaining five matches as they hope to secure the title. Mosta, on the other hand, are now ninth as they suffered a second consecutive defeat. Valletta scored the all-important goal after just six minutes when Miguel Angel Alba’s cross shot from the left was not held by goalkeeper Yves Stephane Moto. 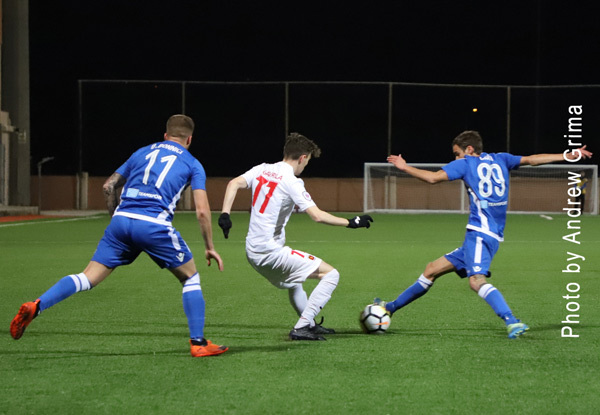 MOSTA Yves Stephane Moto, Gianluca Cuomo, James Brincat (69′ Zachary Brincat), Duane Bonnici, Dexter Xuereb, Rafael Morisco, Davy Angan N’ Guessan, Tyrone Farrugia, Federico Franchini, Akeem Roach, Juri Cisotti. Subs not used: Andreas Vella, Nathan Agius, Luca Gatt, Liam Portelli, Zack Mifsud, Kurt Zammit. VALLETTA Henry Bonello, Jonathan Caruana, Steve Borg, Ryan Camilleri, Antonio Monticelli (85′ Nicholas Pulis), Santiago Malano, Joseph Zerafa, Miguel Angel Alba (74′ Jean Borg), Bogdan Gavrila (68′ Enmy Pena Beltre), Bojan Kaljkevic, Mario Fontanella. Subs not used: Yenz Cini, Shaun Dimech, Kyrian Nwoko, Jeremy Micallef.